Atmospheric venting of hollow surfboards or sup’s is critical. Without a functioning vent, your board will be vulnerable to structural failure due to (primarily) the expansion of air inside your board as the board heats up, which it inevitably does when out in the sun. The amount of pressure build up inside a board can increase to the extent that the board will actually pop! I know this to be true because it has happened to me. Boards going from worm or hot air to cool or cold water will also create suction. The vent will relieve this pressure difference. At first I wasn’t sure what the sound I had heard was, but as soon as I got to the launch site and looked at the deck of the board and how expanded and rounded up the deck was I knew exactly what had happened. The board didn’t actually explode but parts of the deck popped loose from the internal framework and the loud pop I had heard was the sound made by that structural failure. Oh man, did I feel horrible….I only had one board at the time, the surf was good and I needed this board! I had installed two membrane (Goretex) vents and was confident that I had done the right thing. So what happened? The vents I had used were the Goretex membrane type. My comments are not about how “bad” the Goretex vents are, they are about the limitations of any membrane vent. Goretex vents will only transfer a certain amount of air through the membrane. The board I installed them in is a redwood board and what I hadn’t anticipated with the redwood skin on this board is just how fast the darker wood would heat up. So even with two Goretex vents in this board, the pressure built up to the point of failure….so, POW!! was the result. The solution for me is that I now use mechanical vents which are simple screw in/screw out affairs….but you must remember to screw them in and take them out. Pretty simple but you can’t forget either operation. So is there a perfect solution to dealing with pressure build up and suction in hollow boards? No! Paddlers are pilots with little on the pre “flight” check list; fin in, check….vent screw in, check….leash attached, check…pdf on board, check…that’s it…really simple! Paddle On!! Mechanical ventHere is a photo of the mechanical vents I like. 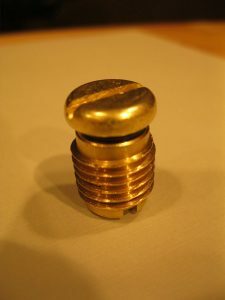 The brass body threads into a wood block attached to the underside of deck, usually somewhere near the tail. The block is drilled through so that venting can occur. Some builders claim you need two vents in boards over ten feet in length but I’m not buying that argument for the mechanical vents. I can see using two vents if you are using membrane vents only, but then, I don’t think that’s a good idea. Sign up for our newsletter and get a FREE Board Assembly Manual! © 2017 Clearwood Paddleboards. All rights reserved. Site developed by Rogue Web Works.